Well having visited the monument several times over the course of the last year to (hopefully) witness improvements and much-promised renovations, I now have to report that not only have those improvements not taken place, but the decay and ruin which has afflicted one of the most important historical sites in the city has gotten worse, and has now also spread to the nearby Wallace's Well. At the same time that the monument and its environs falls into a desperate state of wanton disrepair, construction work has continued at a fast pace all around the site of the capture of the hero of Scotland in 1305. Several house builders have been (or plan to be) involved in building homes around the monument, including Cala, Dickie and Stewart Milne, and despite the fact that the individual luxury homes are selling at up to more than £500,000 at time, little money appears to have been spent to maintain and protect the monument. 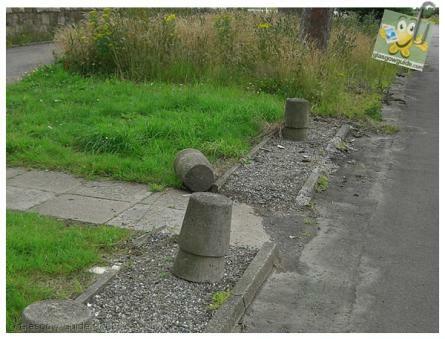 The following photographs taken this month show the extent of the problem: litter, weeds, broken bollards, construction material conspire to present a tacky mess, while surrounding walls have never been repaired to their original state prior to building work, and felled trees have still to be replaced. The one improvement made has been the incorporation of a small lay-by for visitors' cars, as shown in the first photograph below. 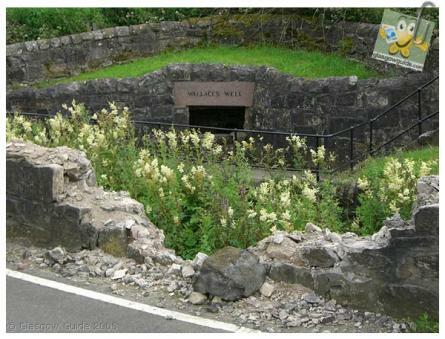 In addition, about a half-mile up the road from the Wallace Monument is Wallace's Well, the site where legend has it that William Wallace took his last drink as free man. Unfortunately what appears to have been a road traffic accident has badly damaged the main wall around the well, and this has went unrepaired for months. ...and just to show that it is not an impossible task to keep the paths clean, provide bins, maintain grass, and keep walls in good repair, here's a photo taken less than two hundred yards from the Wallace Monument. Good job in keeping this public, but who is responsible for the maintenance of the monument and the land surrounding the monument and the well? 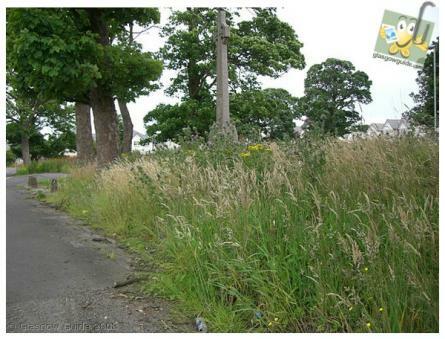 Is it the council or the developers, or a third party such as Historic Scotland? 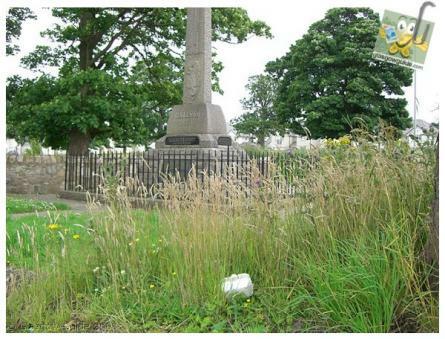 "It was a condition of Stewart Milne's planning application that it builds a small car park or lay-by for people visiting the monument and we understand this is going ahead." 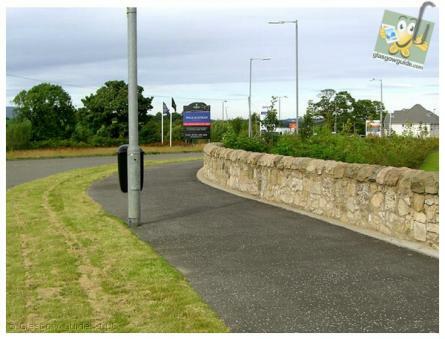 In fact as photo #1 above shows, this lay-by appears to have been built, but it does nothing to enhance the area, and the real problem is the maintenance of the area with regards to litter, weeding, grass-cutting, tree-keeping, as well as the structural repair of paths, walls, bollards and roads. However as I understand it - with regard to Wallace's Well - the area is not listed and could simply 'disappear' one night, a victim of the huge diggers which are on site. "It's an embarrassment for Glasgow. People come on all these Rennie Mackintosh tours and the same could be happening for Wallace, but the parking is terrible in the area and it's not even signposted." At the Supermarket yesterday I picked up a leaflet about the Wallace Monument. 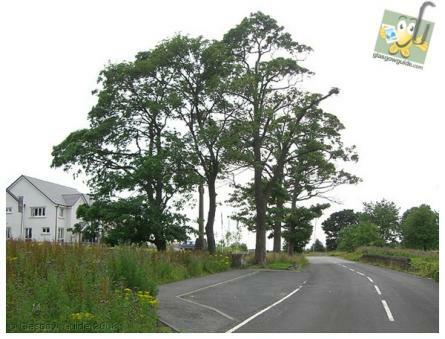 The picture's on the leaflet look lovely, but it is not what tourists will see, and they certainly won't be impressed. Its' not just the developers at fault. 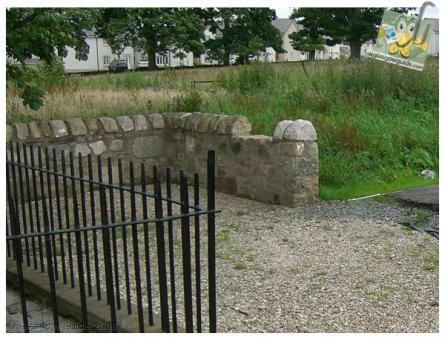 It's their chums in the Labour Cooncil, who refuse to acknowledge the site, or even put some road signs up. If this had been in England and an English Imperialist hero, it would have had the English Heritage Industries protecting it and providing a centre with full amenities. Labour is more interested in its Donald Dewar Statue and all their other Imperialist monuments honouring our national, or socialist heroes, like John MacLean. There is no monument to Wallace in Glasgow High St to his victory in the 'Battle of the Bell of the Braes', where he chased Edward's army back to Bothwell Castle. Nor is there any monument to Wallace's mentor, Bishop Winning, who took Edward's timber for the Cathedral roof and used it as siege engines against him against him. Our Heritage industries are totally useless and a fifth column compared to English, Irish and other heritage industries. Not far away, in Huntershill, Thomas Muir's House lies totally neglected, whilst the Thomas Muir Cafe opposite has a fine cairn and plaques to the United Scotsmen. 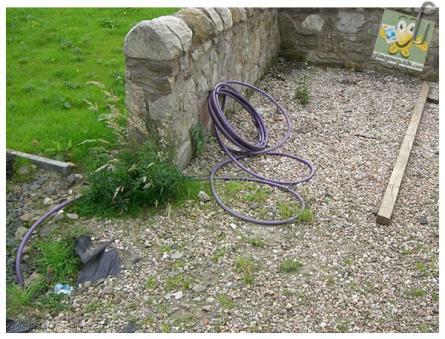 This is the story throughout Scotland and time the Scottish Government acted on this deliberate generations of neglect. I would tend to agree with Donald that the Labour-controlled council must be at fault here. It seems incredible that - at a time when Glasgow is trying to promote itself all over the world - the city officially ignores the strong links it has at Robroyston and Glasgow Cathedral/High Street with one of the most iconic heroes of Scotland, William Wallace. Stirling quite rightly uses its association with Wallace to attract tens of thousands of visitors each year, generating millions of pounds for the local economy... so why isn't Glasgow doing the same? Donald, did you mean Bishop Wishart was the mentor for Willace Wallace???? I think William Wallace lived a few centuries before Cardinal / Bishop Winning. Sorry. I, of course, meant Bishop Winning. All the Churches in Scotland today are to the left of the British Government. It's they wee red skull caps the Bishops wear, makes them all look alike. How very sad this has happened to the Wallace monument I wonder if I should even bother to visit it since it appears so tacky & messy.I Blame all governing bodies for the neglect of such a world renowned monument getting left tae wreck n ruin ,seems to me they invite ridicule & judgement upon Scotland regardless to whom visits the monument & well, there should be a preserved state of approach, one can make to enjoy such a monument & take pictures in the safety of a clean restored tidy enviornment. To think theres a world out there taking pictures of this poor state of affairs & they are likely making Scotland look like the type that cares none for their historical ledgendary places/monuments.Iam sad but extremely angered by the pictures where it is clear they tidy everywhere else up! Come On Scotland /Glasgow, especialy get your mind on the tourism point of view if nothing else please do something that is anything worthwhile to save this historical place from further judgement & embarrassing litter.Shame on You Governing bodies that matter in this equation! Nothing changes then. My Dad and SNP man Gil Paterson from Bishopbriggs used to go and clean rubbish(beer cans etc) from Wallace's Well in their spare time and that was nearly 30 years ago! Dad moved to Inverness 26 years ago or he'd probably still be doing it now. They tried then to get the powers that be interested in preserving both sites but it was passed from department to department and nothing got done. There's not even a sign post anywhere telling visitors where it is. It's been said in other posts but IT'S A DISGRACE.  I at first want to know if there is anything I can do to help. I dont live in Glasgow just now, but was born and brought up in 26 Sheila street, Robroystan. heart and soul. I am appalled at this from a council that calls itself Scottish, and wont lift a finger to protect a national monument. My mother used to tell us the story of wallaces well, and I cant believe that nothing is being done to make this into a more respectable site. It is without doubt a national monument and all true Scots should be in disgrace at not keeping it , and looking after it for future generations.